louisgray.com: Pretty. Functional. Frail. My Macbook Air Hinges Fail. Pretty. Functional. Frail. 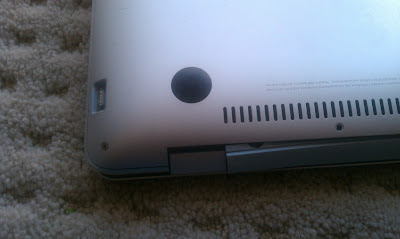 My Macbook Air Hinges Fail. Earlier this year, I switched from my MacBook Pro to a new MacBook Air, aiming to move more of my content to the cloud, and have a less bulky device to take with me from office to office and trip to trip. For the most part, the experience has been very good, and if I can help it, I don't want to go back to thick laptops again, with their spinning hard drives and clunky optical drives. But the beautiful design and thinness of the machine also has made it susceptible to failure. For more than 18 months, MacBook Air's first and second generation customers have complained about defective hinges which are a design flaw with the machine, requiring potentially expensive replacement. Now, mine too have fallen victim. A few weeks ago, when visiting partners with Barak Hachamov, my colleague at my6sense, he opened his MacBook Air, and we both audibly heard a cracking sound. The frame had a horizontal crack through it, and the screen became very wobbly, needing to be supported by something to lean on. He took his laptop to the Apple Store in Palo Alto, and as he resides in Israel and I am local, I was asked to pick it up. 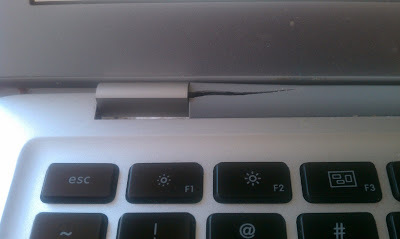 A week later, after taking his laptop home, my own MacBook Air decided to join the club. Without any odd behavior on my part, without requiring any exceptional level of force or falls, or even knocking against anything, my own Air frame is cracked and the hinge has practically come apart at the base. Solidarity with Barak's machine? Perhaps. So last night, I was back at the same Apple Store, telling them of my sad story. The folks at the Genius Bar commented on the relative newness of my machine (though not the latest and greatest) and said they see this problem frequently. The good news was there would be no charge, but they didn't have parts on site, so I'll be headed back at least two more times - first to drop it off, and later, of course, to pick it up. 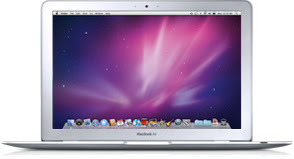 "You can take your MacBook Air to an Apple-Authorized Service Provider or Apple Retail Store for evaluation and repair if necessary, even if your product is out of warranty. If you previously paid for a repair for hinge-related issues that were not caused by accidental damage, you may be eligible for a refund. Contact Apple for more information." Diving deeper, it seems this issue has been hitting Air owners for more than 18 months. About 150 people have contributed to a thread started in February of 2009 on the hinges breaking during normal use. Ars Technica covered the spike in complaints back in March of 2009 and Engadget in late February of 2009. But I didn't buy my own laptop until early 2010. Although it was refurbished, saving me some cash, I would assume the issue was known and examined. While at the Apple Store, I got my first chance to see the newest MacBook Air devices - both the 13 inch and the 11 inch models. It's tempting, of course, to get this one fixed, wipe the drive, and sell it on eBay or Craigslist, just to move to the next generation, but I would have to warn the recipient that I couldn't guarantee the integrity of the device. It's pretty. It's functional. But it's broken.